that you may not have learned in school. When she was three years old, this little princess with blond hair and big blue eyes, lived in a beautiful palace with her mother, her father, baby brother Alfie, and a much older step-brother from her father's first marriage, named Henry. When her father died suddenly, Henry became King and imprisoned the little princess along with her mother and brother in a far away fortress and forced them to live in poverty. Her mother went mad with grief and remorse, often talking to herself and crying out that she saw ghosts. The little princess had to take care of little Alfie by herself most of the time. There was rarely enough to eat or fire to keep warm. Before her father died, he had written a will that provided for his second wife and her children, but her evil step-brother ignored his father's last wishes. Why? Because he was unable to have children of his own and feared that little Alfie would someday usurp his crown. At only six-years old and while she was still in exile, Henry negotiated a marriage agreement for the little princess to wed the younger son of King John thus aligning their neighboring kingdoms. Henry remarried and his second wife, had a daughter (allegedly by her lover) to be Henry's successor. He felt it was safe to bring the little princess, now 10, and Alfie, 8, to the palace where they could be given the best education and royal training. Suddenly they were living in bright rooms filled with silver and gold, wore clothes of the finest silks and firs, and always had enough to eat, but he kept them separated from each other and he forbade them to leave the castle, even to visit their mother. Henry was a bad ruler who let injustice go unpunished. Officials were corrupt, robbers and thieves roamed the open roads and terrorized the villagers. Instead of protecting his people the king spent his money on luxuries and allowed corrupt nobles and officials to steal from the treasury. His honest nobles were in revolt and wanted to get rid of Henry to save the country. To strengthen his hold on the throne, Henry secretly tried to break off the marriage arrangement he had made with King John. He arranged to have the young princess married to John's conniving older son Charles instead. But when King John learned that Charles had gone behind his back to try to cheat the younger son he was outraged. King John made his younger son, Fred, his successor and for plotting against him, he threw the older son into prison, where he died. By the time she turned 14, the little princess was well educated in reading, spelling, writing, grammar, mathematics, art, chess, dancing, embroidery, music, and religious instruction. Since she knew that Fred would be king someday and she was still his betrothed, she set out to learn law, philosophy, languages, and other skills that would be important for a future queen. What she didn't know was that she would reign as Queen in her own right. Have you guessed who she is yet? Every schoolchild knows her name. At 14, Henry tried to marry the princess off to his recently widowed brother-in-law and simultaneously marry his supposed daughter off to his brother-in-law's son, so the princess's inheritance would eventually all go to his daughter and her heirs. However, the princess took matters into her hands and refused this dangerous arrangement that would have made her more valuable dead than alive! Civil war broke out over King Henry's plotting and his inability to govern. His nobles called for the 12-year-old Alfie to be put on the throne or at least named as Henry's successor. Henry needed quick money to put down this rebellion so he arranged for the princess to be married to a wealthy courtier for a huge sum of money. What would she do? The girl cried and fasted and prayed to God for 24 hours to be delivered from this fate. She even threatened to kill herself, but her best friend and lady-in-waiting, Beatrix, vowed "God will never permit this to be, and I swear to you by all that is sacred before it happens I will myself plunge a poignard (dagger) into his breast." Lo, and behold their prayers were answered! On his way to meet his betrothed, the wealthy courtier suddenly fell ill and died on the highway. But the girls' celebration at this news was short-lived, for the same plague that killed her would-be bridegroom also struck her beloved brother Alfie and he died so suddenly that the rebels claimed he was poisoned by King Henry's wife. Should she overthrow her step-brother? On this news the rebellion grew and Henry was without funds. He had angered so many of his allies that not one would offer help. The young princess was approached by none-other than the Archbishop who sided with the rebellion and told her that all she had to do was agree and they would depose King Henry and set her on the throne. Her answer proved her wisdom and concern for the welfare of the people. "The work of rebellion is only to excite passions and sow discord, to light the blaze of civil war and to put all in danger; to prevent such evils is it not better to tolerate in the state some abuses of which the consequences are not so fatal? A fruit which ripens before its time can never last. Ambition to reign has no place in my heart, and I desire that the crown of Castile shall not be mine until death shall have ended the reign of my brother. Make the evils to cease which have for so long a time cursed Castile, and I shall look upon your submission as the most signal service you can give to me, and the best mark of your affection." To make peace, King Henry was forced to sign a treaty conceding to the rebels that the princess was to be his sole and incontestable heir, she could marry whom she willed but he would have the right to approve the marriage. And with that he was allowed to live out his reign, which turned out to be only six more years. The Duke of Gloucester, who was destined to become Richard III, paid suit for her hand in marriage as did the brother of the King of France, but the princess held out until an ambassador from Aragon arrived to tell her that her childhood betrothed wanted to marry her. He was the best choice for their kingdoms and their marriage would completely consolidate her claim to the throne, but she had never met him. Would she even like him. She was only 18 and he was even younger. Nevertheless, putting her faith in God, she and dashed off a letter to her step-brother asking for his approval. He didn't even bother to write back. Instead he plotted once again to put his own daughter on the throne. Do you think you know the name of this famous queen? Keep reading for more clues. When she heard King Henry was breaking the treaty, she declared that she didn't need his approval and she signed the articles of marriage agreement herself. King Henry arranged to have her kidnapped but she was informed of the plot and appealed to her friend the Archbishop of Toledo. He sent a regiment of dragoons (elite fighters) to rescue her and transport her to a safe castle. She knew that Henry was desperate to stop the wedding so plans were made to get the couple together for the ceremony as soon as possible. Prince Fred, disguised as a wool merchant's servant, had to cross the countryside, traveling only at night. One day, Prince Fred was recognized when they stopped in a tavern. In their haste to escape they lost their purse with all their money in it. Eventually they made it to safety in a castle one day's ride from his bride's residence. Letters were exchanged with the princess. A few days before the official wedding day she told friends that she was taking a short trip to visit her brother's tomb. At the same time Prince Fred and four of his friends set off for a secret rendezvous with the girl he planned to marry. Neither of them had ever laid eyes on the other. She was pleased with what she saw. Though he was younger than her he was already taller and stronger, and very brave, a leader in his own right. He had dark hair and eyes with thick lashes. His lips were full and somehow that made her quiver. He too was swept off his feet by her beauty and spirit. She was a shapely 19-year-old-girl, with long blond hair worn loose around her shoulders. She looked like an angel with her pale complexion, rosy cheeks, small mouth, and bright blue eyes, but she had a devilishly keen wit. He was delighted by her intelligence and understanding of warfare. Though they only met for two hours and were accompanied by chaperons, they fell in love and vowed to rule as equals. But there was one more obstacle to their marriage. They were second cousins and needed a dispensation from the Pope to marry. Cardinal Rodrigo Borgia helped them obtain permission and they were wed on October 18, 1469. King Henry died five years later and within two days she proclaimed herself Queen of Castile but it was not a done deal. 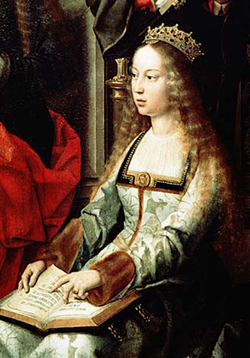 Even though Henry had signed a treaty that declared her his sole heir, his 13-year-old daughter who was already married to the King of Portugal, also made claim to the throne of Castile. The first seven years of her reign were difficult. Her husband was away at war with her enemy, Portugal. When she could, she rode by his side in full armor and even led battles when her husband was unable. When the war ended, she walked barefoot through the streets to a church where she offered thanks for the victory and praise for all the people who had won it through their valiant efforts. Who was this little princess who knew her own mind? Queen Isabella I of Spain. She and her husband King Ferdinand II of Aragon ruled as equals. They are best known for sponsoring the first voyage of Christopher Columbus, which led to the opening of the "New World", but she did much more than that. She reorganized government, removing all the officers and appointees that did nothing for their large salaries. She took away many of the privileges and powers of the nobility and even reversed the illegal sale of estates Henry had sold to raise money during the war. She reformed the monetary system and standardized the coinage thus halting the out-of control inflation that was destroying the economy. She established a national police force called the "Santa Hermanadad" and abolished the local militias that were brute enforcers for the local nobility. She restored justice and order to the court system so that everyone from nobles to peasants could trust the judges to be fair and impartial. She and Ferdinand even held open court every Friday to hear the suits of the common people, a practice unheard of. Most important, they united all the small Spanish kingdoms, save Portugal, into one kingdom with one language, one economy, and one culture that made it into a major world power. But she became intolerant as she got older. In order to unify the country, Ferdinand and Isabella forced all the Jews and Muslims to leave Spain or convert to Catholicism. They also petitioned the Pope to allow them to commission an Inquisition to find converts who secretly followed their old religions. The Pope agreed and they appointed Torquemada, a name that is synonymous with torture and cruelty today. Queen Isabella I died November 26, 1504 and was granted the title Servant of God (the first of 4 steps of canonization) by the Catholic Church in 1974, 500 years after her birth. from the painting "Our Lady of the Fly"
If you want to read more about Queen Isabella I here are some interesting links. If you want to add this article to your list of favorites or email it to a friend, please use this permanent URL, https://stores.renstore.com/-strse-template/1305A/Page.bok. Permission is granted by the author to quote from this page or use it in handouts as long as you include a link back to Renstore.com.